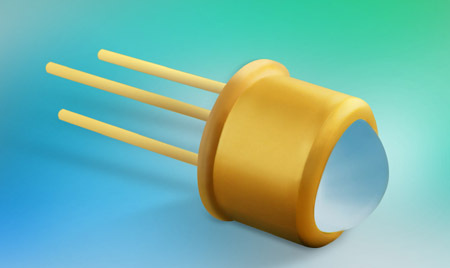 Opto Diode Corporation, a global supplier of advanced performance photodiodes and highly reliable, visible and IR LEDs, introduces new OD-469L High Output Blue LEDs. Featuring a narrow beam angle, the new LEDs are ideal for fluorescence in medical, scientific testing instruments, and forensic applications. The new lighting device is available in a hermetically-sealed TO-5 can with three leads. The electro-optical characteristics at 25 degrees C deliver total power output ranging from 80 mW (minimum) to 170 mW (typical). The dominant emission wavelength is from 465 nm to 475 nm with typical operation at 470 nm. Absolute maximum ratings (at 25 degrees C) include 1000mW power dissipation (infinite heatsink), 350mA continuous forward current, peak forward current (1 1/0 duty cycle at 1kHz) at 2A, and reverse voltage at 5V. Thermal parameters for storage and operating temperature are -55 degrees C to 100 degrees C, with the maximum junction temperature at 125 degrees C. The lead soldering temperature (at 1/16 inch from the case for 10 seconds) is 260 degrees C, making them easy and convenient to install into an existing or new system design. Available for shipping now, Opto Diode's new high output blue OD-469L LEDs are affordably priced at $10.25 each, minimum order of 100 pieces.